The hw4400 may look like a small, normal desktop, but the Intel Core 2 Duo chip and over 1G of frontside bus mean very little waiting for almost any program to execute. 1 The xw4400 sits comfortably inside a shiny, unassuming mid-size tower case. Nothing about it hints about the power it contains. 2 Getting inside of the xw4400 is extremely easy, and the single latch makes it compliant with Section 508 as well. 3 First impressions are good. Cables are neatly bundled to one side and you can get in and get at all the expansion slots and drive bays. Notice the CPU housing. The Core 2 Duo is protected by a stack of heat sinks and its own vertically mounted fan. When powered, the CPU fan blows heat off the sinks and into the exhaust fan in the upper corner. 4 Almost everything, and certainly everything you can do in terms of normal maintenance, does not require tools. To remove an expansion card, you simply push the two green tabs in and pull back the retaining bar. When finished, you snap it all back into place. 5 A view of the surprisingly clutter-free expansion slots. 6 A close-up of the cooling scheme over the CPU. When shopping for cars, you can tell by looking at some models that they are built for speed. With computers, it's a lot harder to guess at what's under the hood. The looks like a rather unassuming desktop PC, the kind you see lining the shelves of Best Buy or even Radio Shack, good for e-mail and basic applications but not for anything approaching cutting edge. But don't let the standard mid-size tower case fool you. Beneath that plastic-and-metal cover beats the heart of a true performance monster. The fact that the xw4400 has the name workstation in its title could serve as a clue as to what you get when you buy this one, though we have seen systems that were 'workstation' in name only. So what do you get with the xw4400? At the center of this system is a 2.4-GHz Intel Core 2 Duo processor. At first we were not too impressed with the raw specs. A processor speed of 2.4 GHz is not exactly cutting edge. But when you consider that it's a Core 2 Duo processor, and that Microsoft Windows has pretty much perfected looking at that completely like two separate chips, you really have something. In fact, the xw4400 scored 11,020 on the GCN/Alterion benchmark, which is the highest-performing system the lab has ever tested. And for those of you who need even more extreme speed, there is an xw4400 model that kicks that up to a 2.93-GHz Core 2 Duo. Besides the processing power offered by the Intel E6600, the model we tested had an amazing 1,066-MHz front-side bus. With over a gig of throughput, it's no wonder that business applications in the GCN/Alterion benchmark like Photoshop, Excel and PKZip were able to breeze through their tasks. And if you need to send data out or bring it into the xw4400, the Gigabit Ethernet port will get the job done, eliminating the outside bottleneck if your switch and network can handle it. Nothing on the xw4400 is low-end. Our unit had 1GB of DDR2-SDRAM and was expandable up to 8GB. 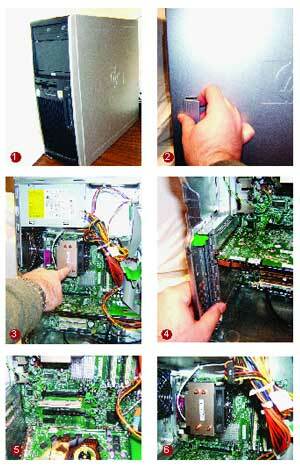 The hard drive was a 160GB SATA model that spun at 10,000 RPM, and had read/write speeds of 1.5GB per second. You could really feel the speed of both the memory and the drive when installing programs from a CD or DVD in the combo drive. The xw4400 wrote programs to the hard drive extremely quickly, finishing installs in 30 seconds that took well over a minute on other systems. The graphics processor was an NVidia Quadro Pro FX 1500, which is an extremely high-end card, especially for mid-range graphical applications like those you would find in business applications. If you need to step up further, you can get an xw4400 with a Quadro FX 3500 instead. Considering that the workstation is housed in a 17.7-inch by 6.7-inch mid-size tower case, we expected the insides to be rather cluttered. Surprisingly, the bundling of cables inside the system was very clean, leaving a reasonable amount of room for someone to work at installing components or manipulating the six expansion slots. Getting into the case is extremely easy. All you have to do is pull on one lever and the entire side panel pulls off. It's a little bit harder getting the side panel back on, but not overly difficult. There is a tab for a small chain lock in the back if you don't want unauthorized persons getting to the internals. Once inside, most work can be performed without tools. To pull the graphics card out of its PCI Express slot, for example, you first have to push two green tabs and pull back the bar the tabs were holding. This frees all the slots so cards can be removed or added. The only disadvantage to this that we found was that the metal slot blockers sometimes fell out of place once freed, assuming you are working with the unit in a standing-up configuration. If you have the space and the time, laying it down flat would avoid this. Despite the high performance, the xw4400 also hits the mark on value. The unit we tested has a government price of $1,999, which puts it in line with other desktop systems with less impressive performance levels.